Why do I see so few penthouses in Tenerife North? What has the azotea got to do with it? Where are the penthouses in Tenerife North? I had assured you that luxury real estate in Tenerife exists in my previous page called luxury apartments in Tenerife. I was even going into detail about one. Nevertheless, my curiosity keeps on pestering because there could be so many more penthouses all over Tenerife. 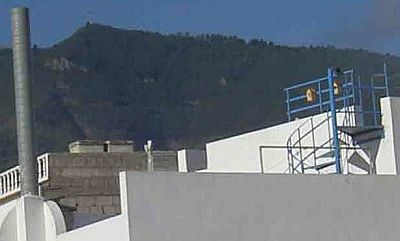 Just now again, my eyes had been wandering over the rooftop scene below and, beyond a particular penthouse in Tenerife North by Puerto Cruz. However, they are so few compared with the numerous Azoteas that I spot. My mind keeps on nagging: "Lack of penthouses in Tenerife North!" Should we all move to the South? How many rooftop apartments are there really in the South, would be another question. One should not be mislead by offers, mind you...For rent, oh, for rent you will find many, for sure.. So, the market for penthouses in Tenerife must be there in the South which would surely also apply to the North. Please, look again at a similar photo below. It has more light. Tell me where you see penthouses in Tenerife North in the suburb that's depicted. If I had the right glasses I perhaps would discover many Azoteas with washing moving in the breeze. I would see people, cats and dogs. My friend Cesar said that he would own binoculars if he had such views. "Oh really", I answered, "but, not me..." He laughed. He always does. Let me get serious again. 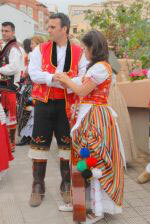 You know, one could really say that the Azotea is part of custom and, culture and Tenerife. Le Corbusier would agree with me that the Azotea helps the social aspect, as it helps to keep in touch with neighbors. The Azotea which stands in the way of the penthouse in Tenerife North and, South is an absolute option for better socializing. Indeed, it prevents loneliness. By the way, sun loungers are sometimes being provided on Azoteas. When that happens, the Azotea who prevents those extra penthouses in Tenerife North and South is then promoted to luxury solarium, ha. Solariums are a great marketing feature for the letting of holiday homes in Tenerife... Of course, more penthouses in Tenerife North or, South would stand in the way, unless they are let out or for sale. But, live and, let live, is my motto. So, I am all for luxury apartments and penthouses for a private holiday home under the Tenerife sky. The sun is definitely laughing more often than in the more Northern regions. You might be lucky to get invited to an Azotea Tenderete Fiesta in a rural area. This is folklore singsong with music made with typical Canary instruments. People are dressed in traditional costumes. Wine and food is normally served. It's fun. A lot happens on Azoteas. So, lets forgive our hosts which are the gracious Tinerfeños that they don't make more way on their Azoteas for penthouses in the north or south of their island. .
Around the bend from my building there's this Azotea. Can you believe it, one with a pigeon loft on top. Double click on it, you will get a better view of the loft, right next to the pink wall. I call it the pigeon penthouse in Tenerife North. Why penthouse? Well, pigeon houses in gardens are the norm. One of the wild pigeons here, a tiny feathered, ordinary chap, had been courting Susi, the Jaco(breed name), a beautiful, big, red beaked silver-gray and, white coated parrot girl of a neighbor of mine. The courting pigeon was lucky, he could convince Susi to escape from her owner. She got away for the third time. You see the blue fence, that's the penthouse veranda, where red beaked Susi had been trained to talk. Can you make out the bird boxes hanging on the rails? Now you may discover them both, pigeon and, parrot sometimes high up in the sky, happier than kids, for their wings. Birds don't care about Azoteas. They wouldn't be concerned about penthouses in Tenerife North. But I tell you, Susi, was sitting on mine. Penthouses in Tenerife come handy for a stopover of a bird. Yet, she was looking at me so suspiciously. When the owner came to fetch her, she flew off. At least the shaded birds chirp merrily when the sun comes up. They indeed, sing me out of my sleep..
That's Tenerife for you, not much different when it comes to Azoteas than many a country in South America. The Azotea must be a very old Pueblo Indian custom. But, hardly anybody climbs them with ladders any more. Does anybody know if Azoteas are still existing in Egypt? Do they have penthouses like in Tenerife north? You know, sometimes, you even see dogs on rooftops, all alone. In penthouses in Tenerife North our two legged friends are, of course, also steady companions. But, there they are enjoying the human touch. Yes, some Azoteas are big like one I know in La Orotava. I could only give you a glimpse of the view of the balcony on the last floor. Unfortunately, I don't have a picture of that Azotea, only one from the balcony below. 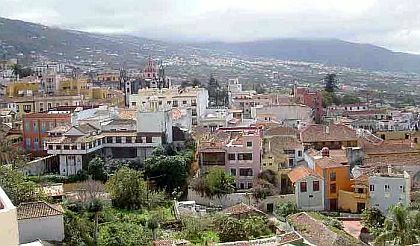 Azoteas, Spanish shindels, perhaps penthouses in La Orotava. I know Germans that grow what they are calling bio veggies on an Azotea in Tenerife. What is that? Bio-veggies are organically grown vegatables. I wonder, if they would also do it on penthouses in Tenerife North. They use makeshift containers, built just for that..
One day, I'll describe how they do it. So, what about the future? 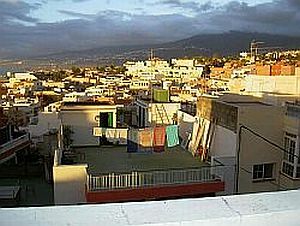 Is there hope for more rooftop apartments in Tenerife North? Yes, there is. The government of the ecologically vulnerable island of Tenerife is taking steps. 5 star hotels will be the exception. Easier loans for constructors are proving already that something is being done. There is hope. Prestige holiday homes and penthouses are under construction. Some penthouses are coming up. Hurry, you might get your cut if you looked at off plan apartments in North and South. I wish that I could afford it. What an investment! Investment for the sake of the island and, for holidays in the sun. Vacations that are heavenly blessed by a great climate that's more than good weather, all year round. Azoteas and penthouses in Tenerife north or South may be reached with cheap flights from almost everywhere in Europe. Please, don't miss out on my RSS blog called "What's new". It's on line, now. Please, subscribe to it... It's so easy to do. By the way, there are many green parrots which live in the tall palm trees of Plaza del Charco in Puerto de la Cruz. A lady I know puts peanuts for them on her balcony. May be, a parrot couple escaped from Loro Park in the past. What is the alternative to a penthouse in Tenerife North or South? 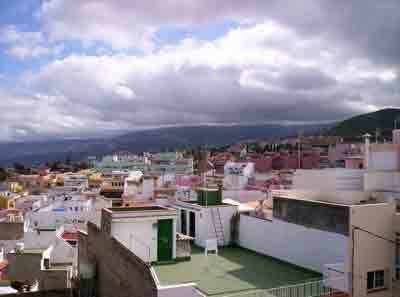 The alternative is this: Please, go from penthouses in Tenerife north to townhouse in la Orotava. Friends of mine who spent their whole life working in the north of Europe bought such a place in 1997. They turned its patio into a luxury indoor patio. Besides, the old place also has a small Azotea on the roof. With all that living in style is of course virtually granted. The lady was born in a Canary Island. That, of course, helps to find the right helpers for renovating at a good price.